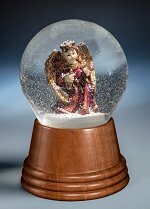 Real Viennese blown glass snow globe with angelic figure inside. Created by Perzy of Vienna, Austria this 80 mm glass globe is mounted on a natural wooden base and the white snow creates a blizzard when you tip the globe. Made in Austria by the original Viennese Snowglobe Manufacturer, Erwin Perzy III, since 1900. 3 Inch Diameter - 5 inches height Ø 8,0 cm - height 12,5 cm Weight: 13.5 ozs - 380g Base is available as Natural European Alder wood finished in a satin varnish (as shown) or a Deco black plastic. Not suitable for children under 6 years of age. Real Viennese blown glass snow globe with a blue chapel within, surrounded by people. 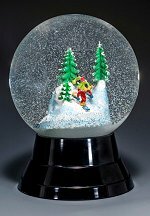 Created by Perzy of Vienna, Austria this 80mm glass globe is mounted on a Natural wooden base and the white snow creates a blizzard when you tip the globe. Made in Austria by the original Viennese Snowglobe Manufacturer, Erwin Perzy III, since 1900. 3 Inch Diameter - 5 inches height Ø 8,0 cm - height 12,5 cm Weight: 13.5 ozs - 380g Base is available as Natural European Alder wood finished in a satin varnish (as shown) or a Deco black plastic. Not suitable for children under 6 years of age. Sorry - Currently Out of Stock! Please check back in 2019! 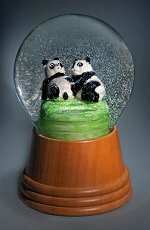 Real Viennese blown glass snow globe with Two playful Panda Bears inside. Created by Perzy of Vienna, Austria this 80mm glass globe is mounted on a natural wooden base and the white snow creates a blizzard when you tip the globe. Made in Austria by the original Viennese Snowglobe Manufacturer, Erwin Perzy III, since 1900. 3 Inch Diameter - 5 inches height Ø 8,0 cm - height 12,5 cm Weight: 380g Base is available as Natural European Alder wood finished in a satin varnish (as shown) or a Deco black plastic. Not suitable for children under 6 years of age. 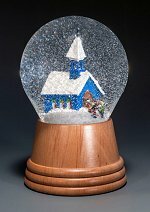 Real Viennese glass snow globe with black plastic base and nativity chapel inside. Made in Vienna, Austria by the original Viennese Snowglobe Manufacturer, Erwin Perzy III, since 1900. 4-3/4 Inch Diameter - 6-3/16 inches height Ø 12,0 cm - height 15,7 cm Weight: 2 lbs-6oz / 1,08 kg Black Deco style plastic base. Not suitable for children under 6 years of age. 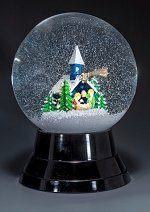 Real Viennese glass snow globe with black plastic base and nativity chapel inside. Made in Vienna, Austria by the original Viennese Snowglobe Manufacturer, Erwin Perzy III, since 1900. 4-3/4 Inch Diameter - 6-3/16 inches height Ø 12,0 cm - height 15,7 cm Weight: 2 lb-6 ozs / 1,08 kg Black Deco style plastic base Not suitable for children under 6 years of age.